My boy would be in heaven if this was him! I have a Huckleberry Finn child. At first, I thought he was merely challenging, hard to manage and extreme. Then a few years ago, I attended a Growing Great Boys talk presented by Ian Grant and he gave me an explanation for my boy. He’s Huckleberry Finn. 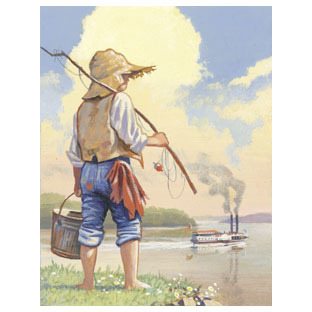 A Huckleberry Finn child is one who is uncivilised. He pushes the boundaries, is so far outside the box that there is no box. He doesn’t easily conform to the mores of society. He’s the kind of child who would have thrived a hundred years ago in an outdoor, hard work environment. He would have loved the freedoms I had in my childhood to roam, explore and discover. His mind is constantly busy and he’s not really interested in sitting down and passively learning. He likes to take things apart and put them back together or invent something completely new out of those old parts. He’s a delight – and some days a despair! Ian Grant said he had four boyhood friends who were Huck Finns, and they have grown up to be leaders in industry, philanthropists, top flight businessmen – in other words, hugely successful in their chosen fields. Ian also commented wryly that these boys would probably be medicated in today’s society and pondered whether they would have reached the same dizzy heights if this had occurred. Before anyone starts to climb on a bandwagon, I do think that there is a valid time and place to use medication – in some cases it is the only option. And I personally know parents who have agonised over this decision, and the positive changes medication has made to the lives of their children and by extension, their family know no bounds. But my Huck Finn? He’s been assessed and it has been generally determined that he is a smart, high-energy, out there child. That’s it. And it has to be said, he comes by his Huck Finn tendencies honestly. I read back some of the things I have written above and a lot of them could have been applied to me, although asthma and a love of reading reined me in a little. My husband’s parents tell tales of his derring do and inventiveness as he was growing up, so my poor boy never stood a chance. In fact, it’s a wonder that we only have ONE outright Huck Finn (although a couple of the others certainly share a number of the tendencies above). I look at my boy, and hope we can successfully guide him through the hoops that modern-day life requires, without crushing his spirit and his outlook on life. And while we are still able to retain our hair! It’s a challenge, but I wouldn’t have him any other way. And I can see that he’s going to DO something with his life – he may be my only child who is a multi-millionaire or in jail. The jury is out on which one it may be. At present, his ambition is to live in Africa and rescue animals from poachers. I could totally see him doing that too! The niggling thing in the back of my mind is that I think MORE of us should be Huck FInns. I think we too easily conform to society’s rules, and we accept too many restrictions too complacently. Why aren’t we outside getting grubby? Why aren’t we trying to think of unusual solutions to problems? Why do we just accept that this is the way things are, without challenging them? Maybe we need to find that long-buried Huck Finn part of ourselves, embrace it, develop it and utilise it! Who knows what we could achieve if we did that? 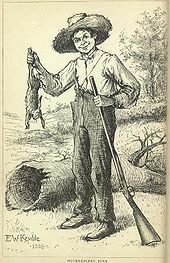 Do you have a Huck Finn in your brood? How do you encourage and help them? I’d love your tips! Our youngest has Huck Finn tendencies (in fact one shortened form of his name – Griffin – could be Finn). It’s too early to tell, but I sure hope so. A great read – thanks.